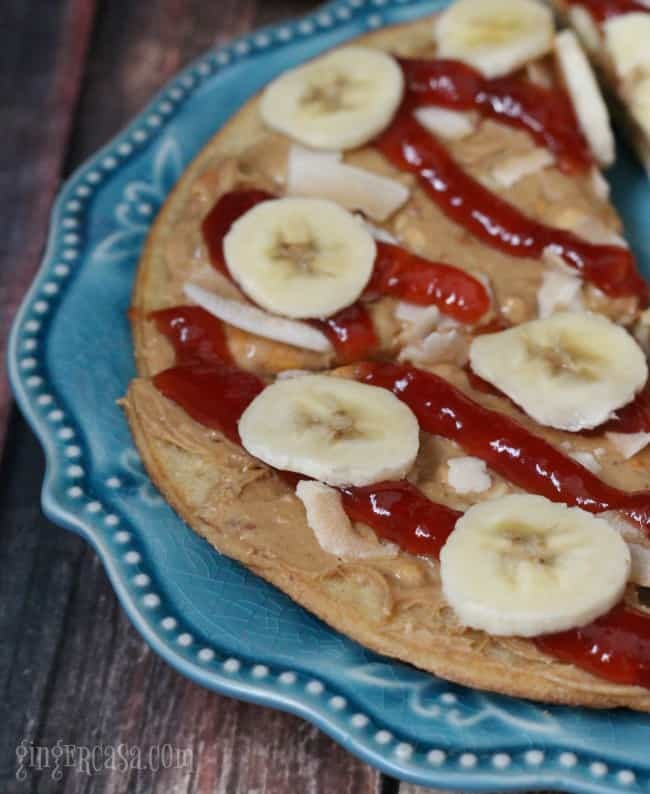 Peanut Butter And Jelly Pizza - A Delicious, Healthy Snack! The kids are back in school and let me tell you, snack time is hard! I am always looking for fun, yummy, healthy snacks for the boys that they actually want to eat. 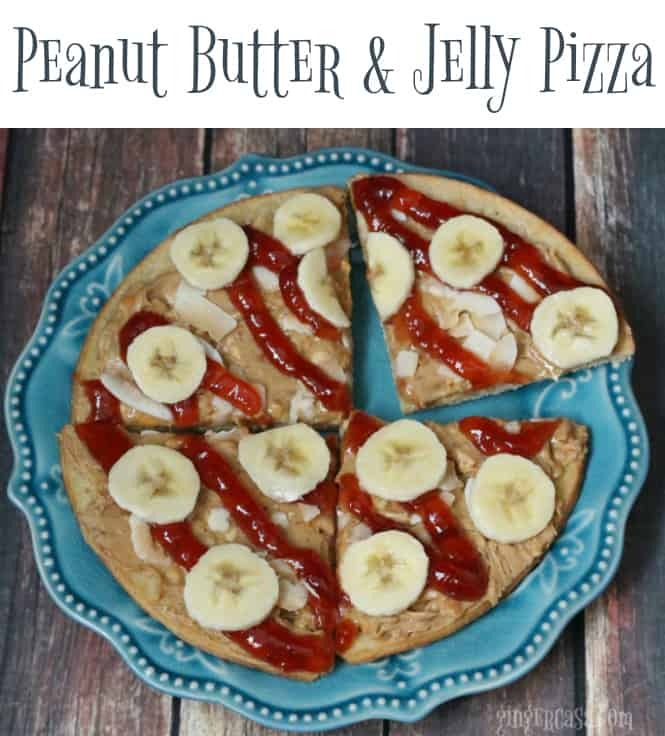 I asked the boys what snack they would create if they could and the 6 year-old came up with peanut butter and jelly pizza! 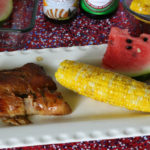 It is very easy to make and yummy for kids and adults. It would make a great breakfast before school, too, because it is loaded with protein! The crust for the pizza can be just about anything, but I chose a personal pizza sized, pre-cooked pizza crust. That way, the kids can create the kind of pizza that they want, with their own favorite toppings. 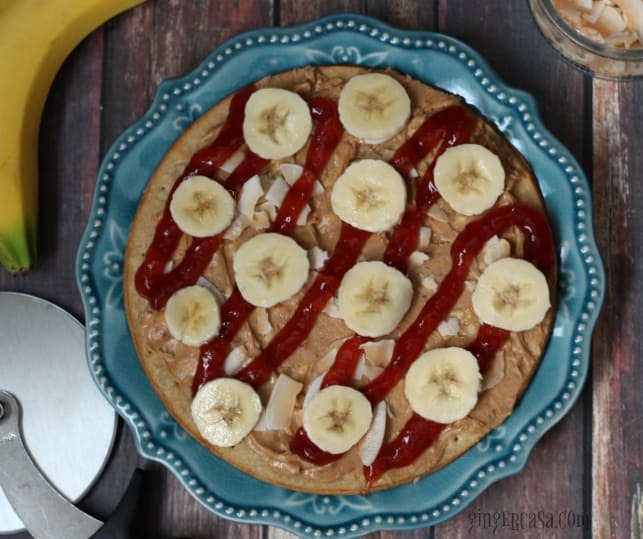 This peanut butter and jelly pizza makes for a yummy snack or lunch! Spead Jif Extra Crunchy Peanut Butter over the cooled crust. Sprinkle toasted coconut flakes over the peanut butter. 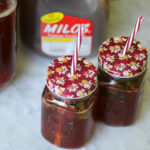 Spoon Smucker's Seedless Strawberry Jam into a sandwich bag and cut off one corner. Drizzle strawberry jam over the pizza. Place sliced bananas over the top of the pizza. Cut pizza with a pizza cutter. Serve with a glass of water or milk and enjoy!